For more than 20 years, dogbitelaw.com has been the starting point for anyone seeking justice, money or safety because of a dog attack. This website has more than 1,000 pages of information for dog bite victims, dog owners, lawyers, rescues, lawmakers and others. It was written by Attorney Kenneth M. Phillips, the only lawyer in the USA who has done only dog bite cases since the 1990's. 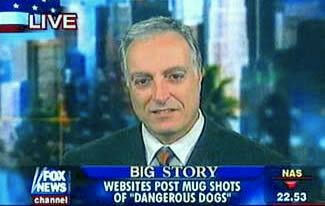 "The senior specialist in representing dog attack victims worldwide" (Animals 24/7). Experience matters! Mr. Phillips has earned tens of millions of dollars for children and adults across America. He works on a contingency fee basis, pays the costs out of his own pocket, and doesn’t get paid for his services or reimbursed for the costs unless he wins. 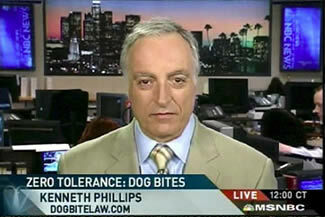 If you are injured by a dog, or a lawyer who needs help with a dog bite case, or a reporter with a question, call Mr. Phillips at (855) 873-3033 or write to him by clicking here.